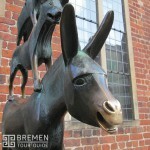 In the Steps of the Bremen Town Musicians. Tour includes: Marketplace, Dom Cathedral, Rathaus, Roland Statue, Bremen Town Musicians Statue, Schütting House and Parliament building. No inside tours included but you can visit the Dom Cathedral´s inside after the tour on your own. Our Guide will give you details about the Cathedral at the end of the tour. If you like to book this tour as a private tour please contact us and we arrange a tour for you and your guests.